The purpose of this site is to provide interesting facts about Native American Indians. 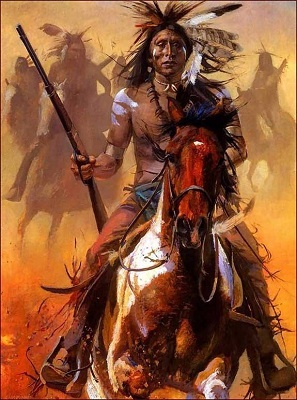 On the pages of this site you will discover information on numerous American Indian tribes including where they lived, their history, culture, how they lived, their jewelry, and who their famous warriors and chiefs were. This information is written for both kids and adults. We will cover tribes from all the main American Indian geographic locations including the Southeast, Southwest, Northeast, Northwest Coast, Great Basin, Great Plains, Plateau, and California. You will find pages about such tribes as the Apache, Zuni, Cherokee, Cheyenne, Shinnecock, and the Hopi. Throughout this site you will find links to sites that have beautiful handmade traditional native American jewelry and gifts for sale. Click here for a great selection of Native Americans Indian Books on Amazon . It is generally believed that humans migrated to America from Eurasia over 12,000 years ago. This migration was made possible by a land bridge named Beringia that use to connect America to Eurasia across what is now the Bering Strait. It is believed that three distinct waves of migration took place across this land bridge. These prehistoric people eventually populated the Americas and formed hundreds of distinct tribes each having their own unique traditions and languages. Below you will find a list of several facts about the indigenous people of America. The other pages of this site contain even more interesting information. The term "Indian" originated with Christopher Columbus. He thought that he had reached the East Indies when he landed in America and therefore named the inhabitants Indians. European settlers to America brought with them diseases to which the Native Americans had no resistance. These diseases killed millions of Indians and resulted in a huge population decline. Europeans brought many animals to the Americas which the indigenous people had never seen, including cattle, sheep, and pigs. Horses had been hunted to extinction by the early settlers of the Americas thousands of years before the Europeans arrived. The reintroduction of the horse by the Europeans had an incredible impact on the American Indians. They utilized the horse for travel, hunting, and warfare. Numerous conflicts occurred between the American Indians and European settlers before the American Revolutionary War , and after the Revolution between the Native Americans and the U.S. government. These conflicts have been named the American Indian Wars. In 1890 the last major battle between Native American Indians and U.S. soldiers occurred. It was called the Battle of Wounded Knee and occurred near the Wounded Knee Creek in South Dakota. Approximately three hundred Sioux Indians were slaughtered. In 1838 one of the most horrible events in American history occurred. This event was a forced relocation of thousands of Indians from their homelands to areas west of the Mississippi River. This march, named the "Trail of Tears", resulted in the death of thousands of Native Americans from numerous tribes including the Cherokee, Seminole, Choctaw, and Chickasaw. Most of the deaths were the result of disease and exposure to the extremely cold weather. Benjamin Franklin learned a lot about democracy by observing the Iroquois Indians. The Iroquois had a chief who ruled only as long as the tribes supported his decisions. The Iroquois were a union of several tribes that had in place limits to power held in place by checks and balances, one of the corner stones of democracy for the United States of America. American Indians have appeared on many U.S. coins including the Buffalo nickel (Indian Head nickel) minted between 1913 and 1938 and more recently the Sacagawea dollar which features the famous Indian women who served as a guide on the Lewis and Clark Expedition.